NEW YORK (JTA) – It might have been the last place you’d expect anger to erupt against the Bernie Sanders campaign. But at a Jews for Bernie brunch in Manhattan’s Tribeca neighborhood on Sunday, the frustration seemed to boil over when some silver-haired Jewish supporters of Sanders began deriding what they described as the campaign’s lackluster response to perceived missteps by the Democratic presidential candidate on Jewish issues – most recently, last week’s interview with the New York Daily News in which Sanders grossly overestimated the number of Palestinian civilians killed in the 2014 Gaza conflict. That interview and other Sanders campaign blunders on issues of Jewish concern, several of them complained, are making it more difficult to make the case to fellow Jews to support the Vermont senator in his bid for the White House. When campaign staffers at Sunday’s event tried to steer the public conversation away from those concerns to focus on the logistics of canvassing, a few attendees became visibly irritated. “I’m very frustrated with the campaign,” Lisa Harbatkin, 72, of Manhattan, told JTA. “Given where today’s left is on Israel, I felt Bernie was too fuzzy on the Palestinians, but good enough. But as the campaign progressed, I became more upset. I wish he wouldn’t hang out so much with Cornel West” – the contentious African-American studies professor who has expressed support for the Boycott, Divestment, Sanctions movement against Israel. Sanders passed up an invitation to address last month’s American Israel Public Affairs Committee annual policy conference in Washington, D.C., and his campaign announced last week that he would be going to Rome to speak at the Vatican. Amid news reports questioning whether Sanders would indeed meet with Pope Francis, his campaign later clarified that the candidate actually was going to a conference hosted by the Pontifical Academy of Social Sciences and that there were no plans for a Vatican meeting with the pope. The actual number was 1,462 civilians killed, according to the United Nations. Hamas’ figure was 1,617 civilians; Israel’s estimate was 762. Following intense criticism, including from Israeli politicians and the Anti-Defamation League, the Sanders campaign issued a statement of clarification noting that Sanders himself had cautioned during the interview that he wasn’t sure of the exact figure, and that when someone later provided the correct number he immediately accepted it. “Understanding that his recollection was about the total number of casualties, not the death toll, the senator immediately accepted that correction and the discussion moved on to other topics,” the statement said. But it didn’t satisfy many of the 70 or so people who showed up at the Jews for Bernie event, which was coordinated by volunteers but included staffers for the Sanders campaign and was promoted as an official campaign event. 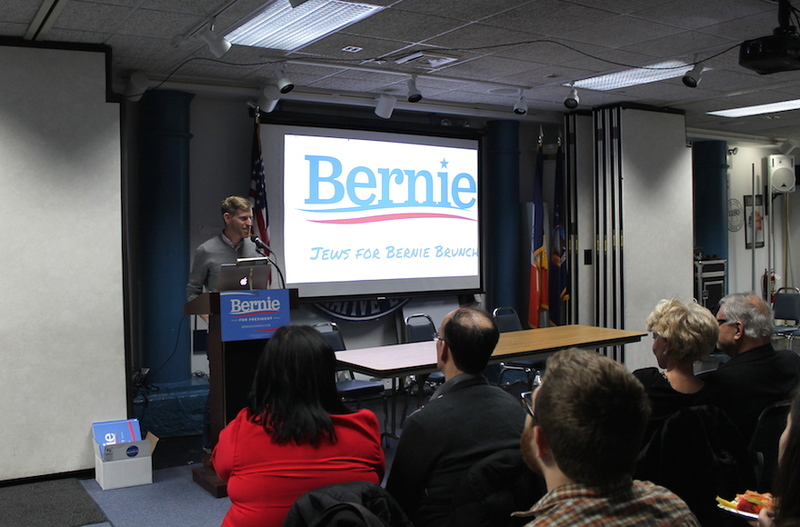 The purpose of the meeting was to help Jewish Sanders supporters coordinate their efforts to promote the Jewish presidential hopeful and get out the vote for the New York primary on April 19. After some schmoozing amid tables laden with kosher-certified bagels, lox and cream cheese, a few campaign workers made some formal remarks and a rabbi for Sanders delivered a topical d’var Torah. Volunteers then distributed sign-up sheets to organize door-to-door canvassing and phone calls to New York voters. But half a dozen Jewish Sanders supporters instead pulled their chairs into a circle to brainstorm bullet points for a flier they said needed to be drafted about why Jews should support Sanders. Sheryl Fetik of Queens said she has spent a lot of time in recent days responding to emails from fellow Jews slamming Sanders’ comments about Gaza. Fetik said she felt compelled to write up a counter-analysis of the Daily News interview defending Sanders. “He wasn’t perfect in what he said, but he knows that Hamas and Hezbollah are terrorist organizations,” she told JTA. Meanwhile, across the room, an activist exchanged vitriol with the campaign’s newly hired national Jewish outreach coordinator, Simone Zimmerman, after demanding accountability for the campaign’s failures on the Jewish front. The argument ended with the disgruntled activist stomping away in a huff. Many of those who attended the event sported Hebrew “Bernie” buttons and said they just wanted to help promote the candidate in the run-up to the primary. This will be New York’s first competitive Democratic presidential primary since 1988, when Jesse Jackson, Michael Dukakis and Al Gore were running for president. Ari Kamen, the New York state political director for the Working Families Party, which supports Sanders for president, said he believes Sanders has a real shot at winning in the Empire State, if volunteers would go out and talk to their friends, family and neighbors directly about the issues Sanders champions. Kamen said he managed to convince his own father, a history teacher at a Philadelphia Jewish day school, to support Sanders. Alfred Litman, 67, of Manhattan, said he supports Sanders because the candidate’s values align with his own, particularly on socioeconomics and social justice. “Bernie is for helping those who need help,” Litman said. Litman noted that his political proclivities are not about Sanders’ religion. “It has nothing to do with his being Jewish. Zero. Because I don’t find him that Jewishly identified, and I am Jewishly identified,” he said. One young campaign volunteer, Sandy Fox, who organized a kosher Shabbat afternoon event for Sanders in the Crown Heights section of Brooklyn on Saturday, said in her public remarks at Sunday’s event that she sees Sanders as a very Jewish candidate. While some American Jews say they are troubled by Sanders’ talk of bringing more “balance” to the American position on the Israeli-Palestinian conflict – the Orthodox Union on Monday condemned Sanders’ remarks on CNN from the previous day — many of Sanders’ Jewish supporters say his positions on the Middle East are part and parcel of why they like him.